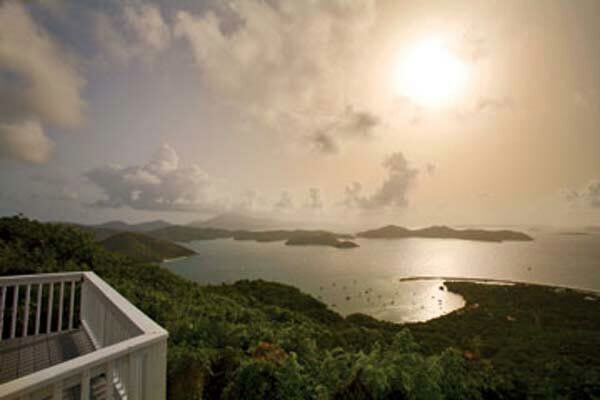 Let the trade winds take you away on a romantic trip to the Virgin Islands. Bask in the sunshine on St. John and enjoy the lush beauty of the island. Stay at Villa MAS SUN for an idyllic couple’s getaway; sunny days, star-filled nights, and the company of the one you love, make your next trip one of absolute paradise. This charming one-bedroom villa is perfect for a romantic getaway. Sweeping views of the ocean grace this hillside home, with the Virgin Islands scattered in the blue water. From its high locale, the easterly trade winds pass through the open doors, cooling off the sunny Caribbean days. The lovely living room is just the place to cuddle up and unwind while enjoying the stunning views over the pool from the plush sofa. Enjoy meals in the fresh air in the outdoor dining area. In the afternoons, delicio us lunches can be accompanied by pleasant ocean views in the bright beams of the Caribbean sun. At night, romantic dinners can be served as the calm of the Caribbean night surrounds you. After the meal is finished, enjoy the dazzling views as the stars sweep out and sparkle across the rich navy Caribbean sky. Private and quiet, Villa MAS SUN is perfect for just getting away, but still close enough to Coral Bay to enjoy all the restaurants, bars, shop, and activities of town. Nature lovers can enjoy hiking amidst the vast beauty of St. John’s preserves, or simply taking in the stunning views form Villa MAS SUN.